No HDMI input? No problem! Here's a handy way to deliver true 5.1-channel surround to a home theater receiver or sound bar that doesn't have HDMI inputs. The Metra Helios CS-HDMABO splits off the audio signal from an incoming HDMI source, and sends it to your audio system through an optical digital or coaxial digital cable. Say you have an Apple TV that you use for streaming movies. And you have a home theater receiver or sound bar that doesn't support HDMI. Instead of sending the entire signal to your TV and relying on its audio output capabilities, simply plug the Apple TV into the CS-HDMABO. 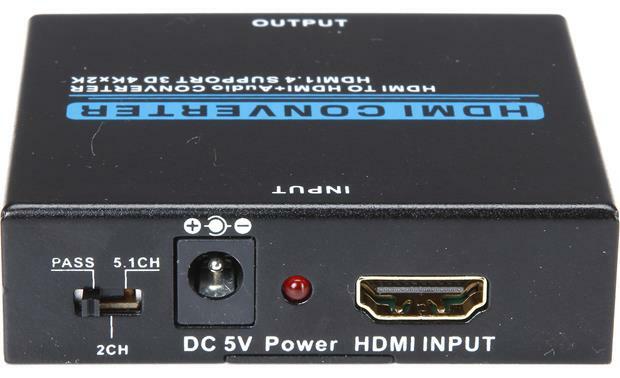 It sends video information to your TV through HDMI, and audio information to your receiver though optical digital, coaxial digital, or even a two-channel analog stereo connection. 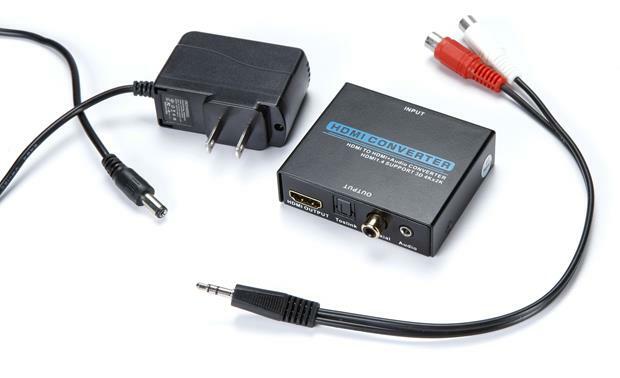 HDMI Audio Breakout Box: The Metra CS-HDMABO helps you add optical (toslink), digital coax, or 3.5mm stereo analog audio connections to an HDMI audio/video signal. Connections: The Metra CS-HDMABO features HDMI, optical/coax digital, and analog connectivity. HDMI Input/Output: There is a single HDMI input and HDMI output. Two Digital Outputs: The two digital inputs consist of one optical (toslink) digital input and one coax (RCA) digital input. Analog Output: The analog output consists of a 3.5mm stereo minijack and comes with a 12" minijack-to-RCA adapter. Audio Output Switch: The output switch determines what type of audio signal is output from the CS-HDMABO. You can select from Pass, 2ch, or 5.1ch. 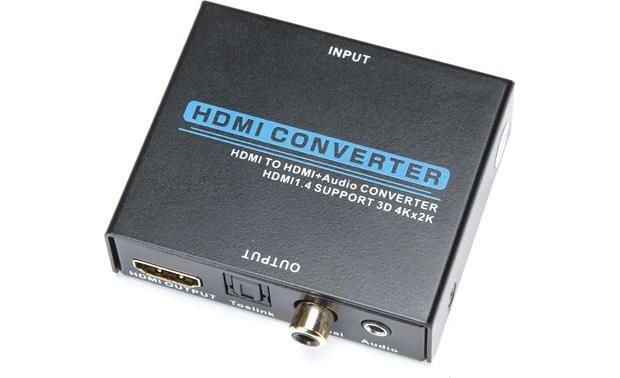 Pass: This is an HDMI pass-through mode which allows audio (up to 5.1ch) and video (up to 4K) from the HDMI input to be output from the device's HDMI output jack. There will be no audio output from any other connection. 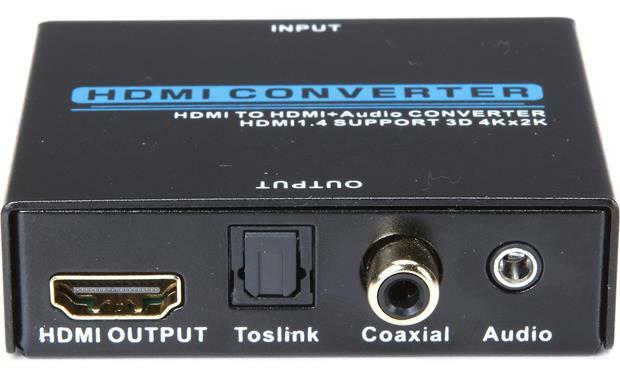 2ch:This is a two channel stereo mode which allows only a 2ch stereo PCM audio signal to be output from the devices HDMI, optical (toslink), coax digital, or 3.5mm analog output terminals. 5.1ch: This is a 5.1 channel mode which allows a 5.1ch audio signal to be output from the device's HDMI or optical (toslink) output terminals. AC Power Adapter: The CS-HDMABO comes with an AC power adapter which will need to be plugged into an AC wall outlet, surge protector, or power conditioner. Searches related to the Metra Helios CS-HDMABO Audio breakout box for HDMI source components.